Have you ever watched a kitten play with total abandon? Chasing its tail? Racing its own shadow? 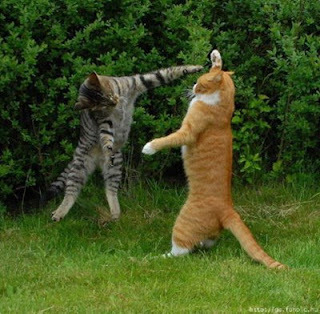 Or running from invisible foes only kittens see? What makes a kitten or cat suddenly do a back flip, or peel out with all four paws up your drapes then back down over the back of the couch like a wild fire is chasing it? And every wise little monkey knows that there's an endless amount of sass in your step when you are wearing your monkey pants. can only occur if you are sporting a pair of monkey pants. Opie Wan Kenobi, my wise, and sagely guru reminds me of this daily. He is never too "grown-up" to participate in a full on scamper up and down the stairs, nor will he turn down a chance to bat at my fingers when I wiggle them so deliciously over the arm of the chair. keeping his kitten-like, child heart intact and active. His imagination knows no limits. His love flows like an electrical current, just like his cattitude. 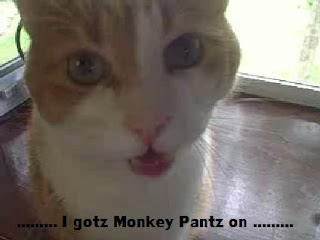 Opie Taylor wears monkey pants. He never worries about tomorrow, or what he will eat today. He is grateful for a bowl of water, and his Tony The Tiger bowl I keep full of dry food. It is a celebration when I open the can of moist food. He knows when Dylan or Superman come over he will get a well deserved treat, and lots of love from them. He dances on his hind legs. He gives them a meow filled with joy. Animals have so much to teach us. Great shots of O.T. Love his monkey pants. I gotta go on a diet so I can get back into mine! I wonder if they make monkey sweat pants.... or monkey spanx. Or maybe we just gotta jump up and down on the bed more. I hope you are feeling better! I'd comment, but I'm busy looking through my closet and my dresser drawers for my monkey pants! Opie - what a cat! He is irresistible. I love his sweet face. I had my Monkey Swim Suit on yesterday...and as it is a swim suit with 'legs' in it (covering as much as I can) ...I think they were officially 'Monkey Swim Pants' cause I was acting pretty crazy fun in the pool...like I was 10...fun day!! It was a Good Day to be wearing Monkey Pants!! Gorgeous cat pics than ks alot for this viua l treat. Hope you are having a good afternoon and evening. ps Hope you are doing well , can't get the descrivption of your accident out of my mind. Every tim e I think of it I want to hug you. The silliness here is why I LOVE working with preschoolers- unashamed, not embarassed, fun! what a nice entry of yours. Yes, saw me own cat running after her own tail (probably two decades ago, thanks for reminding). Currently it's mostly my son who is running after his own shadow, playing with sunlight, coming through the leaves of our lemon trees. Opie Taylor, you are just the cutest kitty ever. The photos are adorable. Blessings of joy t you . Loved your LOL post today. Thank you for bringing light and laughter with a whole lotta love to enjoy a monkey pants day post. I do love to visit your blog. I am so happy to be back to blogging again . Thank you for all the awesome photos . 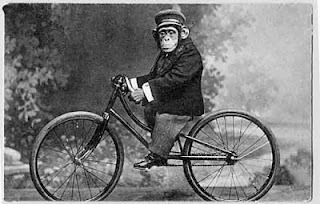 Oh the sheer silliness of monkey pants. 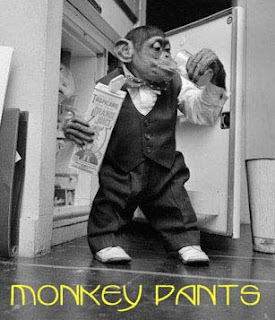 If you Google monkey pants you'll get everything from Bush wearing monkey pants, bars & restaurants named monkey pants, clothing lines, toys, live theater venues, blogs with the phrase monkey pants in them, cats, dogs, birds and kids nicknamed monkey pants... You should go peek just to see the plethora of goodies filed under monkey pants. It's an education... of sorts. But mostly, it's a reminder, especially to myself, to keep putting my monkey pants on every, single day and approach this wonderful life with more glee, less seriousness. I know I've spent way too much time on occasions worrying over things that didn't matter, or didn't need my worrying. I only know this. My cat teaches me more about what kind of person I'd like to become than most people have taught me. He has a playful heart. Who doesn't need that?????? A merry heart is like medicine. Gimme a big dose of that! Please? hah! I'm loving this series, Miss Lille! 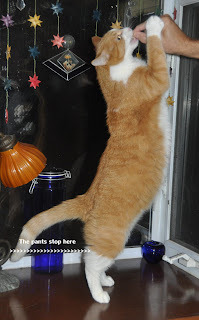 Our orange kitty has puffy pants. I've called them everything from pirate pants to M.C. Hammer Pants, but I have to say, I *love* monkey pants! too funny! !